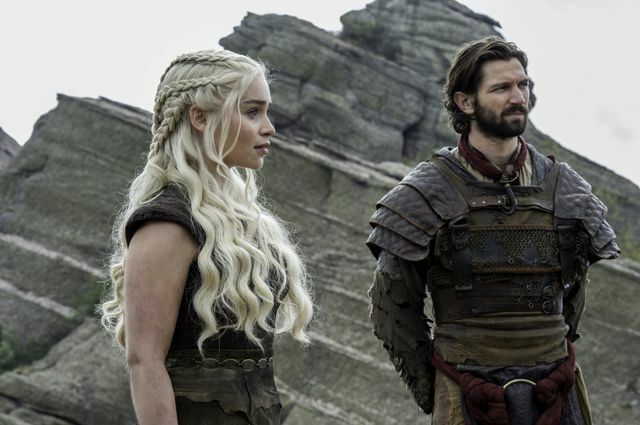 The fourth episode of season six spent plenty of time setting events in motion for the rest of the season and moved the story along in huge ways. 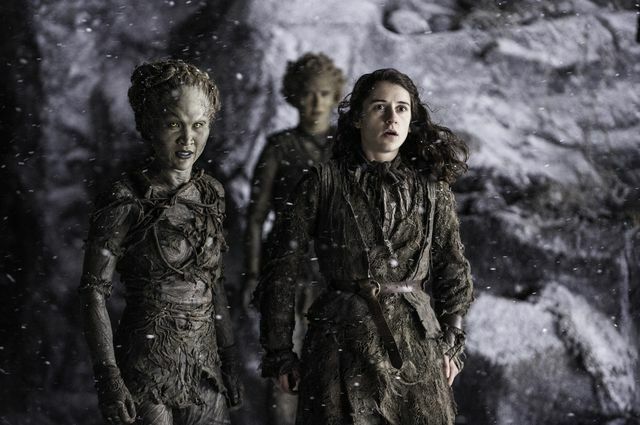 We mentioned our predictions for the fifth episode in our The Door preview. 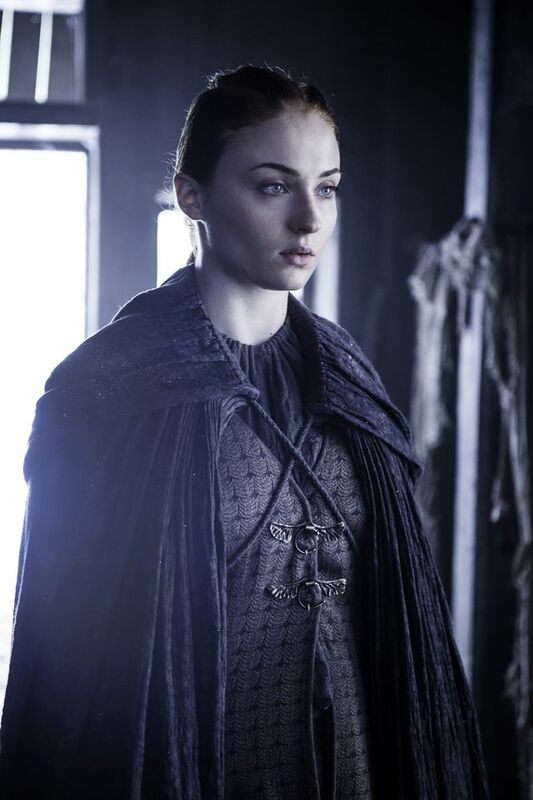 The episode opened up with Sansa Stark (Sophie Turner) sewing. A letter arrived for her requesting her to come to Mole’s Town. 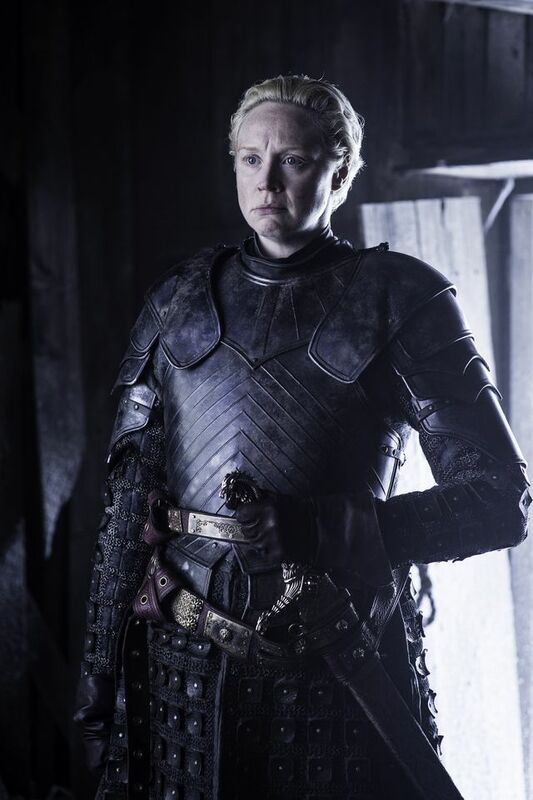 She went with Brienne (Gwendoline Christie) as protection and met with Littlefinger (Aiden Gillen). 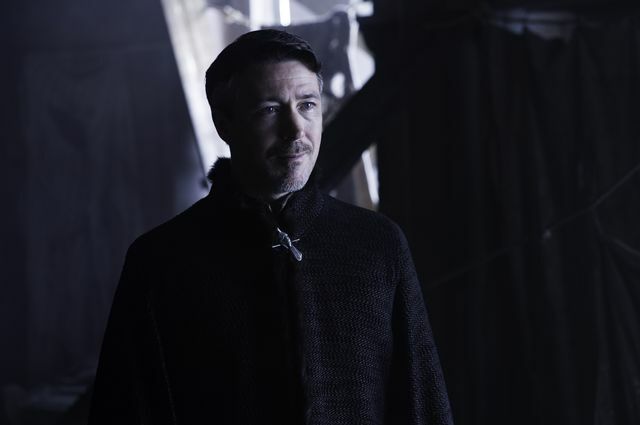 Knowing he’s in a dangerous position, Littlefinger had come with the offer of the Knights of the Vale. Sansa wanted him to tell her if he knew about how sadistic Ramsay (Iwan Rheon) was before he married her off to him. She told him some of the horrid things he did and even suggested she have Brienne cut him down right there. He tried to deny knowing of Ramsay’s cruel ways and said he’d underestimated him and made a terrible mistake. He begged Sansa’s forgiveness and said he’d beg for his life if she wanted. He offered to do anything she asked to try and make it up to her including giving his life. Sansa let him live and told him to leave, she refused his Knights of the Vale. Before he left he pointed out that Jon (Kit Harington) was only her half brother. He suggested she contact her Uncle Bryndan ‘The Blackfish’ Tully who had retaken Riverrun. 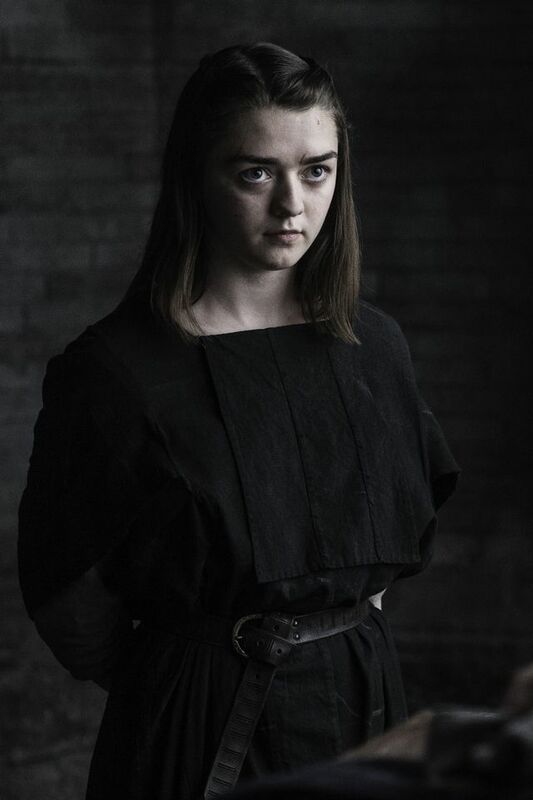 In Braavos, Arya Stark (Maisie Williams), now with her sight back, was training to fight with a staff against The Waif (Faye Marsay). She was putting up a good fight but kept getting knocked down. Eventually The Waif threw away her staff and faced Arya unarmed but still got the better of her. She told Arya that she was not ready and should go home. Jaqen H’ghar (Tom Wlaschiha) walked in and agreed that she was not ready. 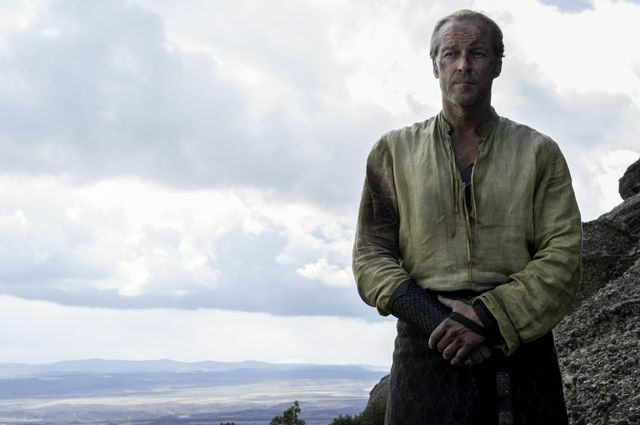 He passed Arya a vial of poison and offered her a second chance, while saying there would not be a third. He wanted her to assassinate an actress called Lady Crane. 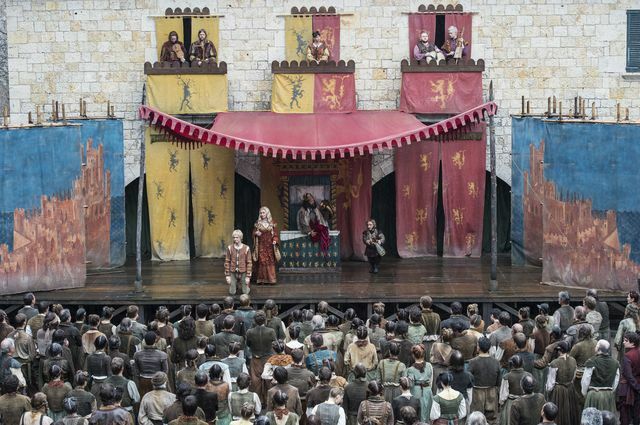 Arya observed a play which was a re-telling of the death of Robert Baratheon and her father Ned Stark. 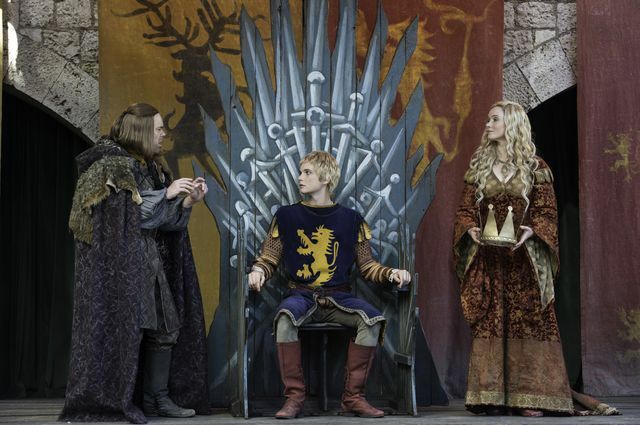 Many other characters were also featured including Cersei, Joffrey, Sansa and Tyrion. 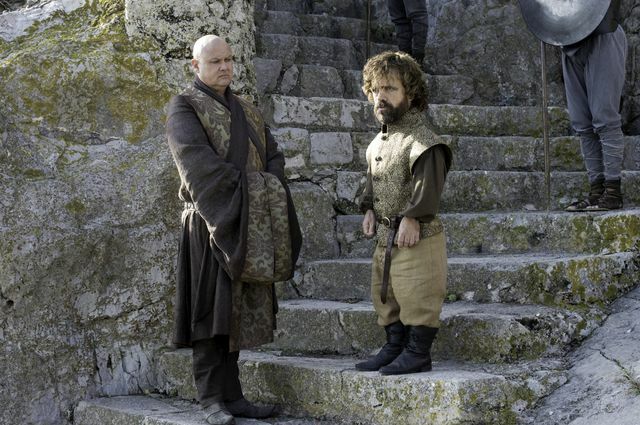 It was entertaining to Arya until she saw the way her father was portrayed as dim-witted. 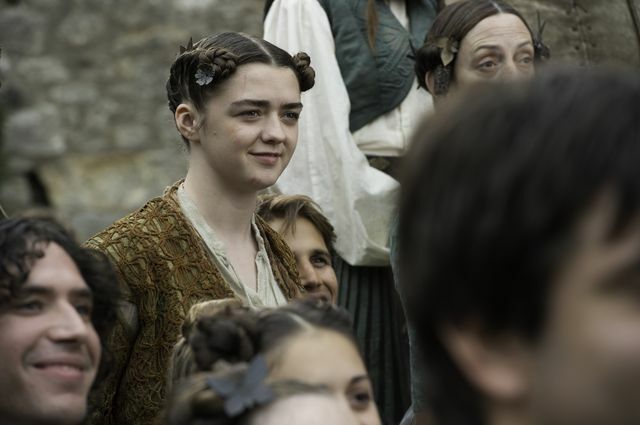 Watching the cast backstage, Arya noticed that Lady Crane drank Rum. She later told Jaqen that would be her way to poison her. She also tried to question her target but was told that slaves should not ask questions. 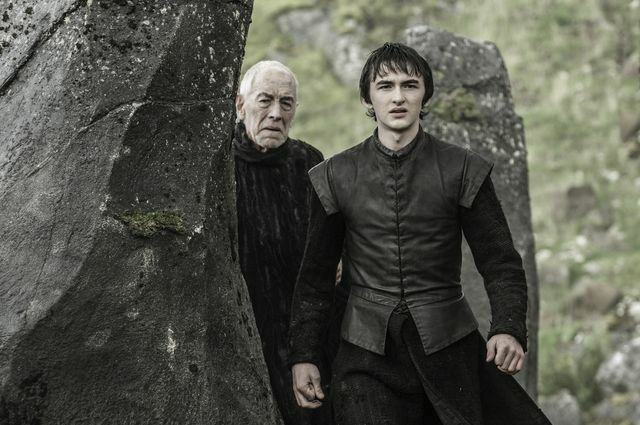 Beyond the Wall, Bran Stark (Isaac Hempstead Wright) and the Three-Eyed Raven (Max von Sydow) were having another warging session. They were observing the Children of the Forest and Bran discovered that they had created the Night’s King. He later questioned Leaf (Kae Alexander) and she said they had no choice as they were at war with man. 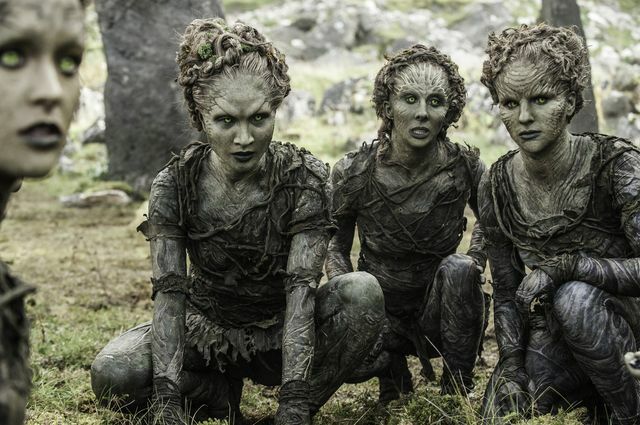 The Night’s King had rebelled and created his own army of wights. 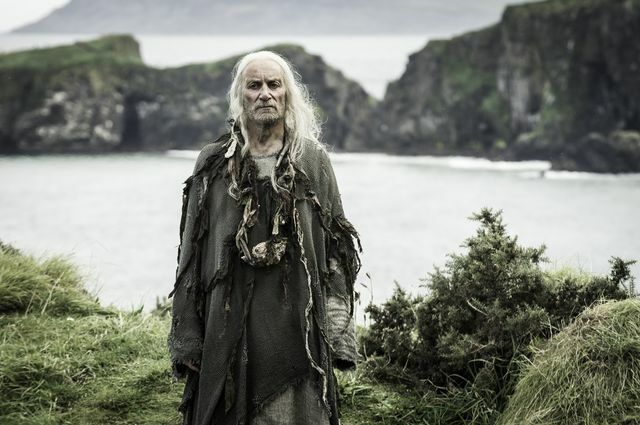 At the Iron Islands, on Pyke, the Kingsmoot was taking place. The Iron Born had gathered and Yara Greyjoy (Gemma Whelan) was first to stake her claim to the Salt Throne. Only used to men ruling the Iron Born were not convinced and pointed out that Theon (Alfie Allen) was the rightful ruler. 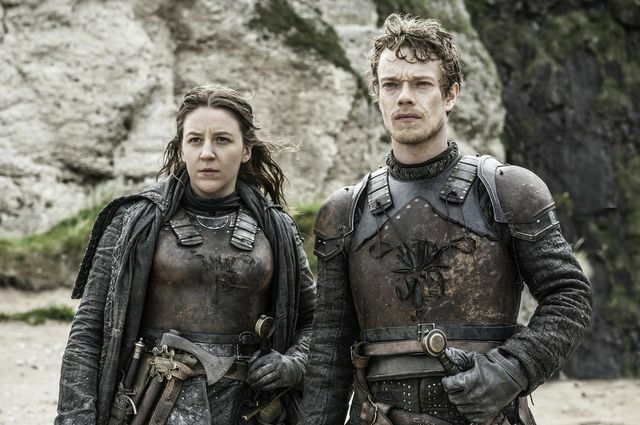 Theon, now tidied up and clad in armour, kept his promise to his sister and rallied for her to become Queen. Just when it looked like she would be successful, Euron Greyjoy (Pilou Asbæk) put in an appearance to make his claim. 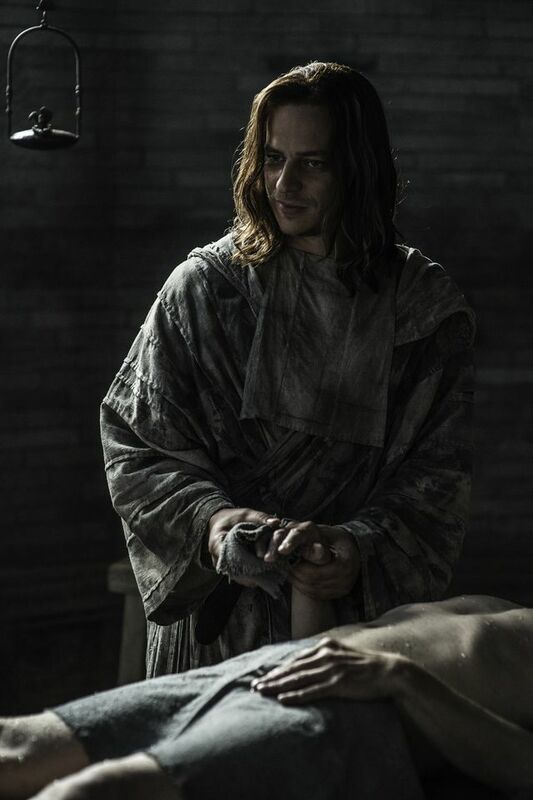 Theon spoke badly of him, Yara wanted him executed and he even admitted to killing his brother Balon. He poked fun at Theon being castrated, promised to conquer Westeros by seducing Daenerys (Emilia Clarke) with the Iron Fleet and marry her. Euron’s speech worked and the Iron Born picked him as their new King. To be sworn in he needed to take part in a ceremony to please the Drowned God. Basically he had to be drowned and survive. As his body was pulled out the water it looked like he might have died but then he coughed up the water and lived. 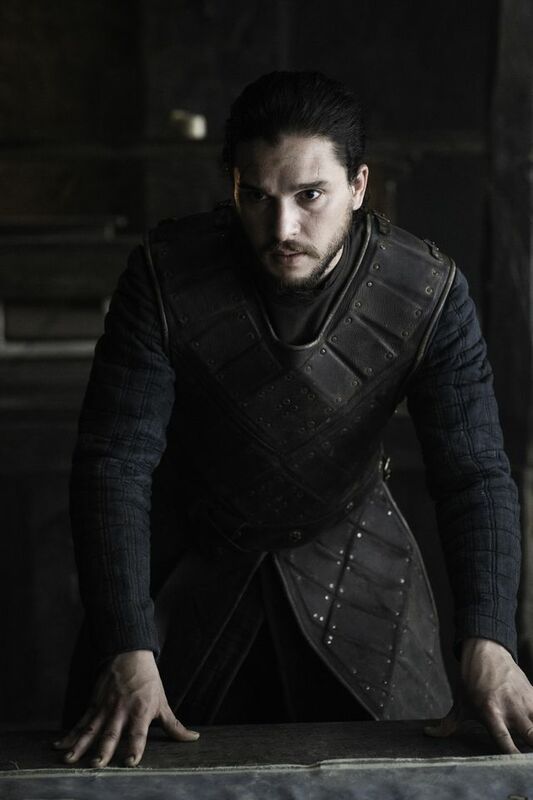 His first job as King would be to kill Theon and Yara. However while he was being drowned they fled with many of the Iron Born taking the best ships of the Iron Fleet with them. 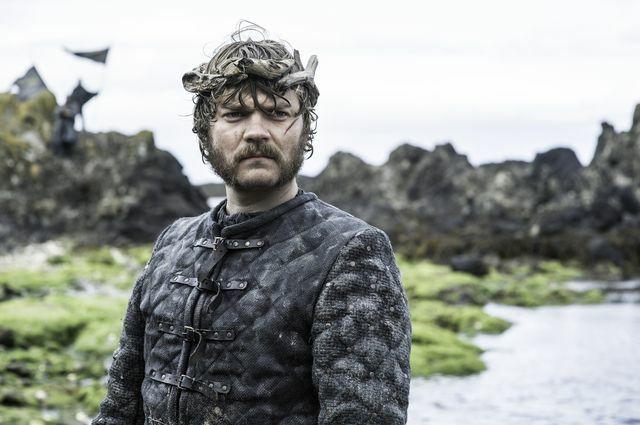 Euron doesn’t seem to concerned and announces they will build a new fleet and go after them. 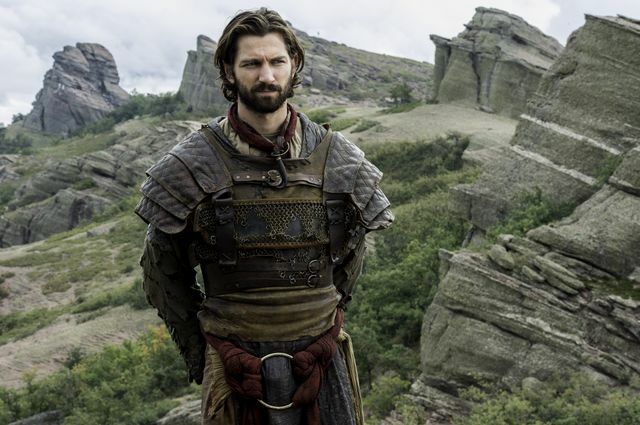 Near Vaes Dothrak, Dany, Jorah (Iain Glen) and Daario (Michiel Huisman) had a chat. She pointed out that she had banished Jorah twice and both times he returned and that he had saved her life. 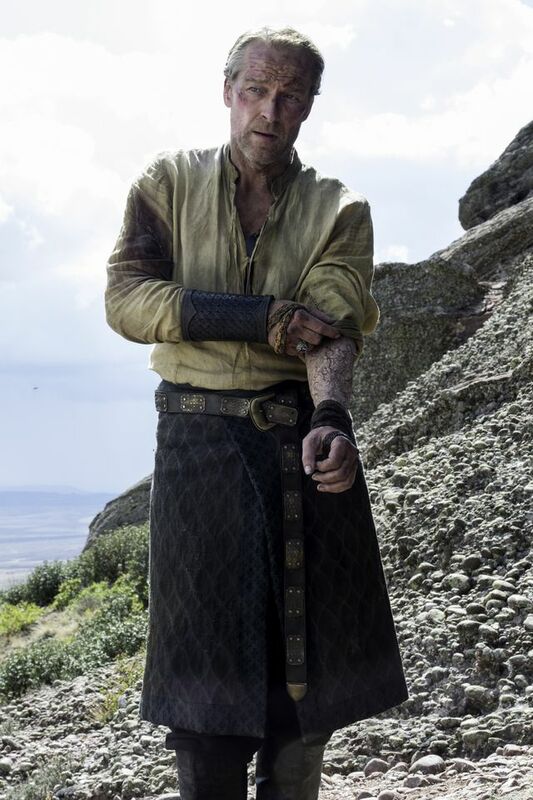 Jorah declared his love for Dany but said he must say goodbye and revealed his Greyscale. Dany was sorry for him and as he turned to leave she commanded him to stay. She then tasked him with a mission to live, find a cure and return to her side. 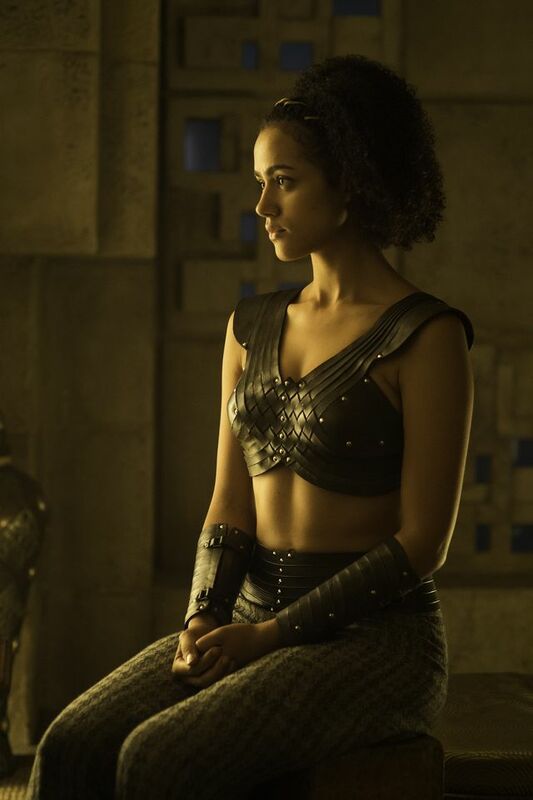 In Meereen, Tyrion (Peter Dinklage), Lord Varys (Conleth Hill), Grey Worm (Jacob Anderson) and Missandei (Nathalie Emmanuel) discussed their situation. Tyrion pointed out that the peace was holding as there had been no attacks by the Sons of Harpy and only two Masters slain. They needed to let the people know that Dany had made it happen. 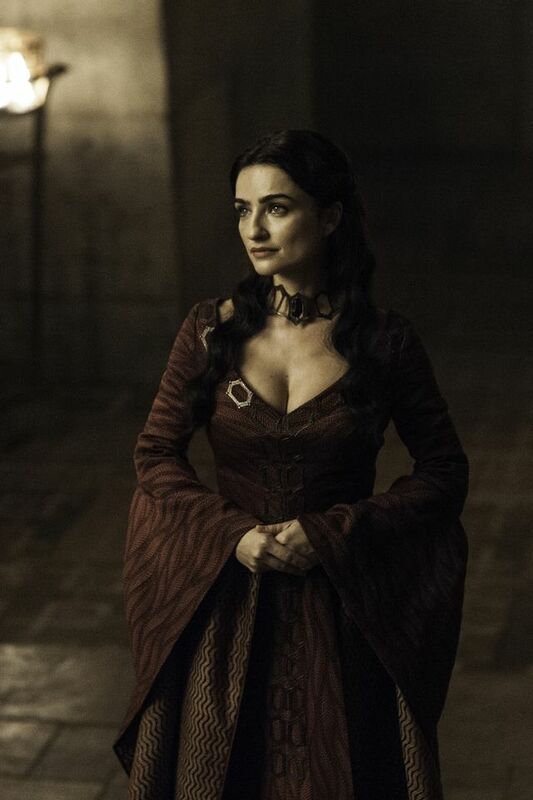 They called on Kinvara, the Red Priestess of Volantis to help spread the word. She agreed but Varys wasn’t convinced. However she scared him by telling him lots of things about his past including the mutilation he had suffered. Back with Bran he was the only one awake. He decided to engage in a little secret warging without permission from the Raven. 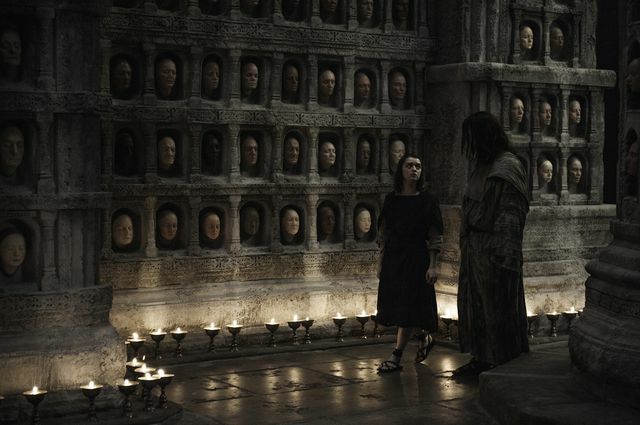 He finds himself stood in front of the army of the dead with thousands of wights and White Walkers. 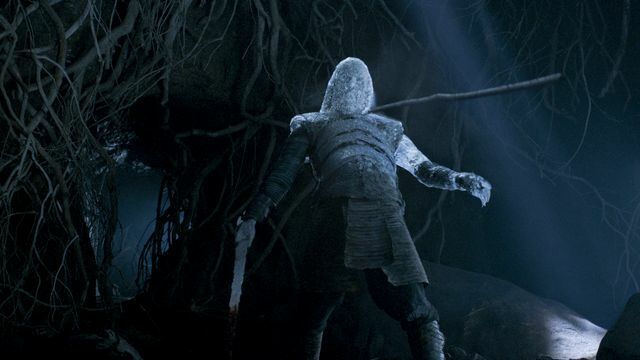 He walked through them and came face-to-face with the Night’s King. When he turned to look back at the army that had all turned to face him. Turning again he was grabbed by the Night’s King. Upon waking he screamed and discovered that a mark on his arm from the Night’s King. The Raven told Bran that he was no longer safe and must leave as the Night’s King would come for him. 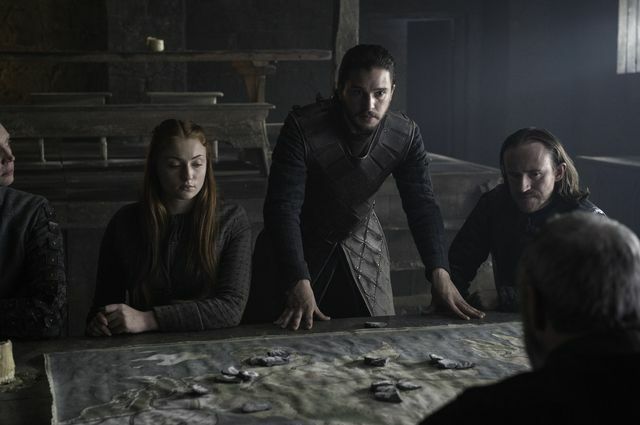 At Castle Black, Jon, Ser Davos (Liam Cunningham), Brienne and Sansa were trying to understand the task ahead of them of how to defeat the Boltons. They knew that the Karstarks and Umbers were in league with them but that other houses had not yet declared their support. 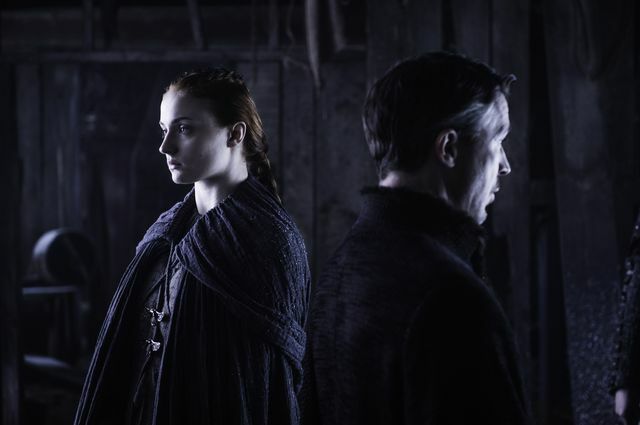 Despite turning the Knights of the Vale away, which she kept secret from Jon, Sansa is confident they can get the support they need. She reminded everyone that ‘The North remembers’ and felt houses would get behind the Stark’s reclaiming their home. Sansa also announced that the Tully’s have retaken Riverrun. Jon was surprised at how she knew and she lied that she heard while at Winterfell. 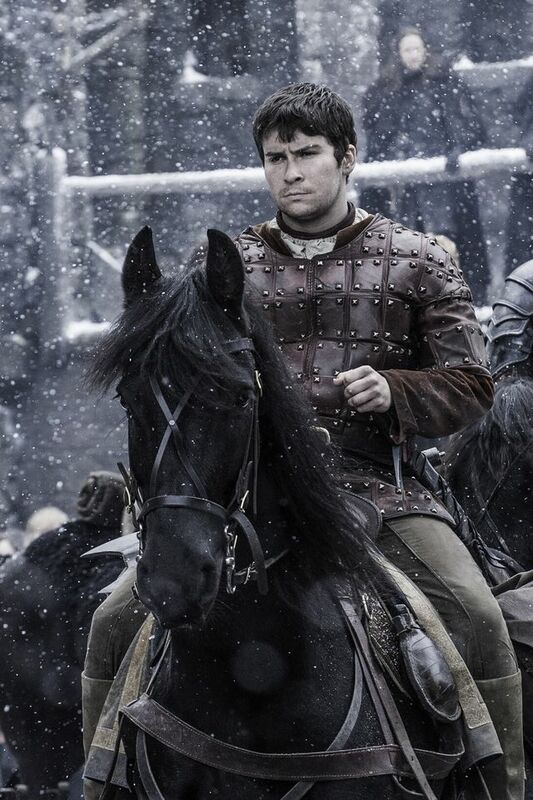 Sansa ordered Brienne to ride for Riverrun to recruit Blackfish and the Tully’s. 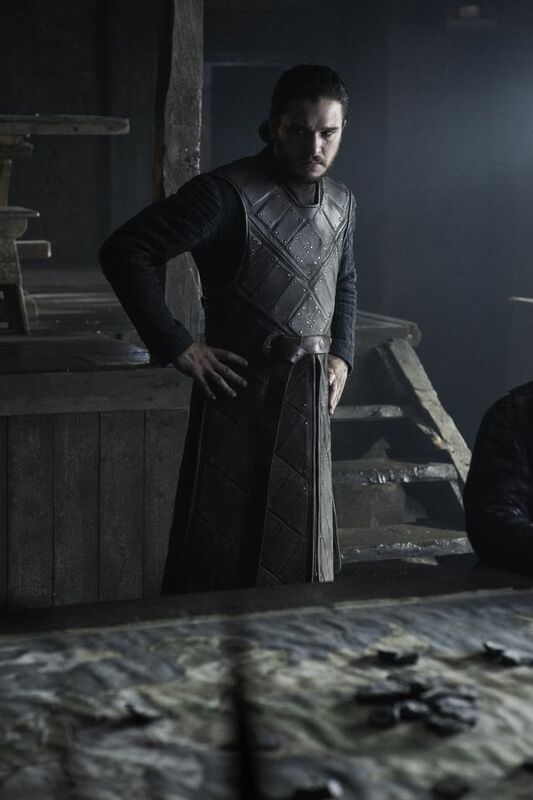 Jon, Sansa, Tormund, Brienne, Melisandre (Carice van Houten) and Davos left Castle Black and left a reluctant Dolorous Edd (Ben Crompton) in charge. 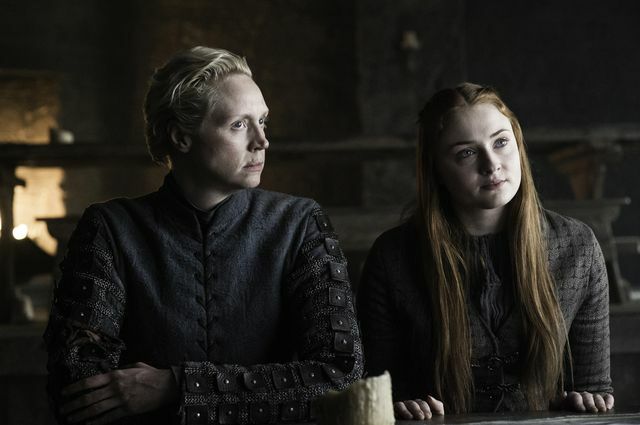 Tormund still appeared smitten with Brienne but she doesn’t seem quite so keen. 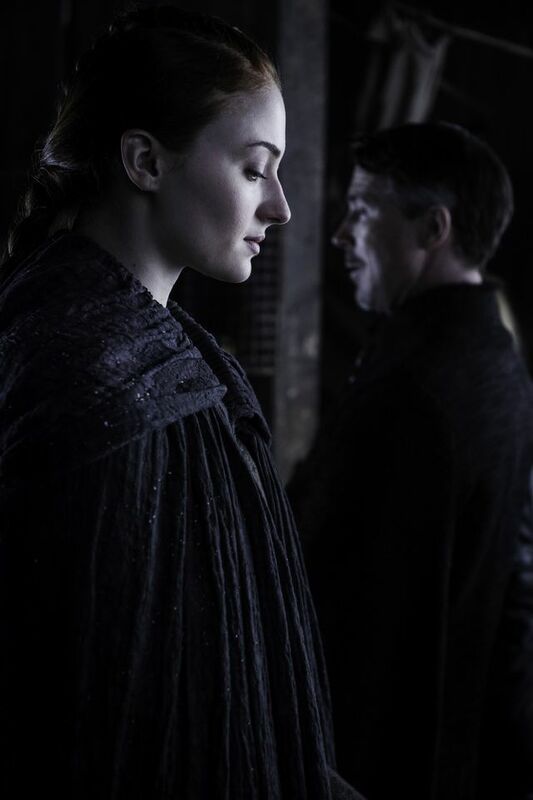 Before they left Sansa presented Jon with a cloak she had made just like Ned used to wear. The episode finished back with Bran. 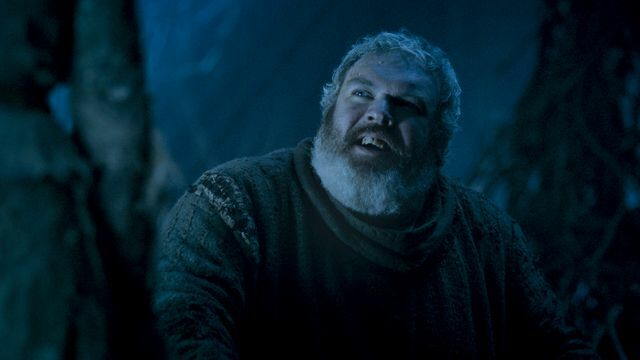 As he entered a final warg session with the Raven to obtain the rest of his knowledge, Meera (Ellie Kendrick) spoke with Hodor (Kristian Nairn) about potential future breakfast options. Suddenly she noticed their breath due to a drop in temperature. 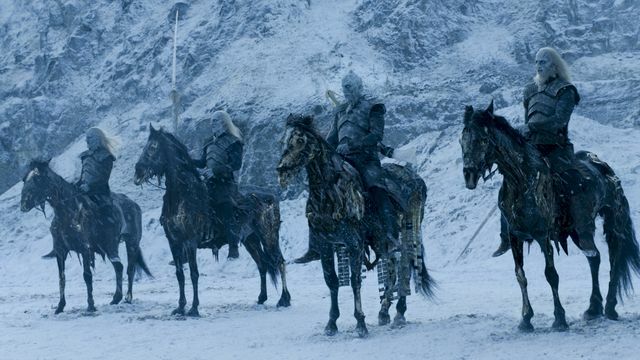 Meera ran outside to find the Night’s King and his White Walker and wight army approaching. She ran back inside as Leaf and the Children of the Forest tried to keep them back with what appear to be magical grenades. 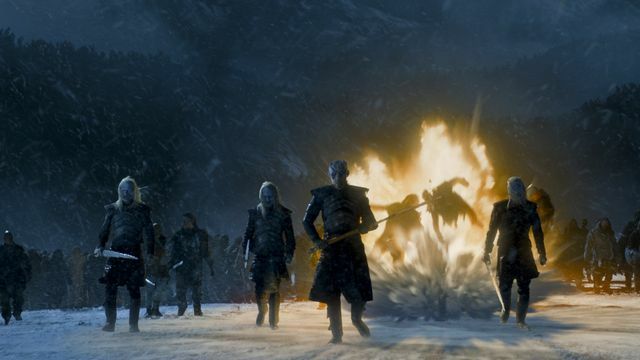 It was enough to stop some of the wights but the White Walkers and Night’s King kept advancing. They walked straight through a wall of fire and entered the tree while the wights swarmed above. Bran was in a vision with the Raven watching his father Ned as a young boy as well as Wyllis (a young Hodor). Meera desperately tried to awaken Bran as the army swarmed in. She picked up a Dragonglass spear and threw it killing a White Walker. Meera shouted for Bran to warg into Hodor and in the vision the Raven suggested he listen to his friend. 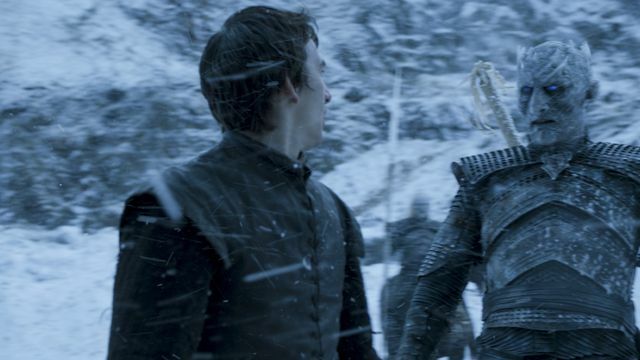 Bran somehow split himself to stay in the vision while simultaneously taking over Hodor to drag him to safety. 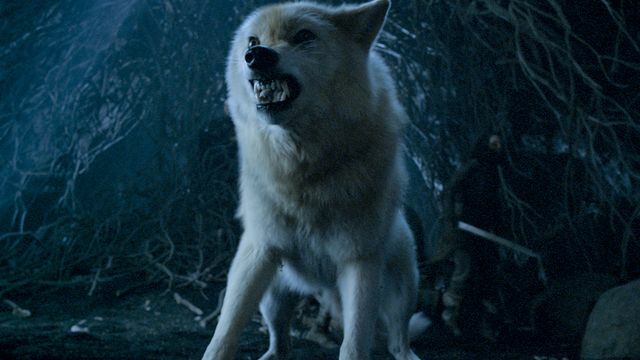 To slow the enemy down Summer, Bran’s Direwolf, gave her life as did Leaf. The Nights King killed the Raven who disappeared from Bran’s vision in an explosion. 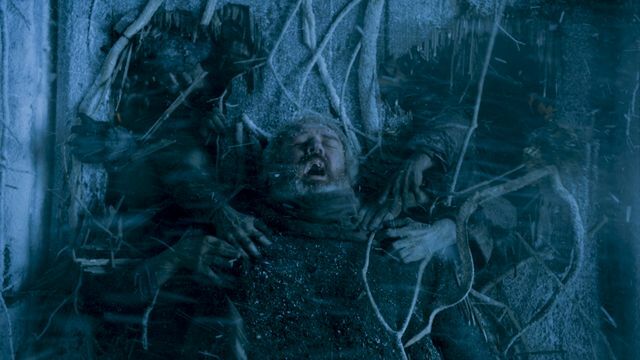 Hodor managed to push a stubborn door open before turning to hold it closed, just as the wights reached it. Meera screamed for Hodor to ‘hold the door’ as she dragged Bran away. 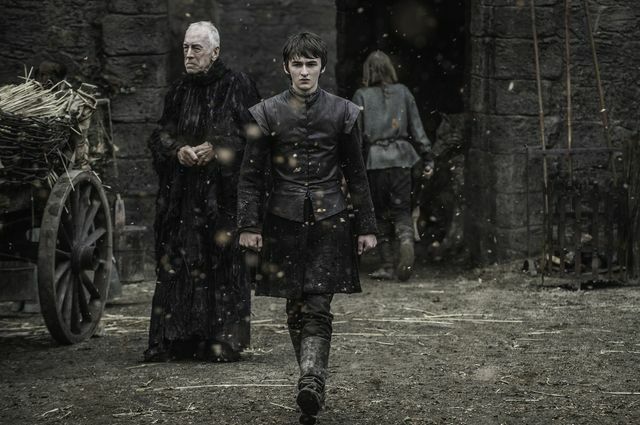 Still in his vision Bran looked at the young Wyllis and told him to ‘hold the door’. Wyllis collapsed in some kind of seizure while repeatedly shouting ‘hold the door’ which eventually turned into a shorter version of ‘Hodor’. It looked like Bran had managed to change the past. He was actually responsible for what happened to Wyllis and how he became known as Hodor. Hodor had lived for that moment to save Bran by holding the door closed. As Meera escaped with Bran, the door began to splinter and Hodor appeared to be overwhelmed. It looks like we just lost everyone’s favourite gentle giant, Hodor. Let us know your thoughts on The Door in the comments below as well as your hopes for the rest of the season. Already looking forward to the next episode? Read our preview of Episode 6 ‘Blood of My Blood’.